I left something at the hotel, can you help me find it? If you have lost an item at the hotel or in your room, please contact the Lost and Found department at 313.465.1853. Yes, we have refrigerators available for a fee of $20 per night, based upon availability. Please contact Housekeeping for more information. Yes, we have a limited number of microwaves available for a fee of $20 per night, based upon availability. Please contact Housekeeping for more information. How can I get a late check out? Late check-outs are offered for a fee and are based upon availability. A fee is also applied for unauthorized late check-outs depending on the time of departure. Please contact the Front Desk for more information. Yes, we have cribs available for a fee of $20 per stay, based upon availability. Please contact Housekeeping for more information. Yes, we have roll-a-way beds available for a fee of $20 plus tax per night, based upon availability. Please contact the Front Desk for more information. 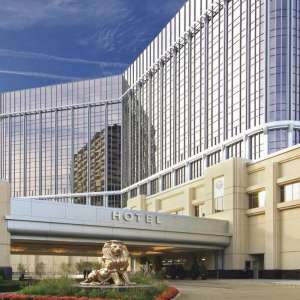 MGM Grand Detroit does offer room accommodations for the physically challenged with amenities ranging from roll-in showers to bathroom handrails. Please contact MGM Grand Detroit Reservations at 1-888-646-3387 for additional information. What’s the minimum age requirement for check-in at MGM Grand Detroit? Guests must be at least 21 years of age to check in at MGM Grand Detroit. The credit card holder must also be 21 years of age. Does MGM Grand Detroit offer parking for hotel guests? Complimentary Valet Parking is available for all hotel guests. Guests may also choose to park in the complimentary Self-Parking Structure. Please note, the parking structure is not connected to the hotel and luggage is not permitted on the casino floor. Our standard check-in time is 4:00 PM, however you may store your luggage at the Bell Desk until your room is prepared. Our standard check-out time is 11:00 AM. Please note that late check-out and early check-in requests are based upon occupancy and availability. Additional charges may apply. We are sorry, but we do not provide complimentary transportation to and from the airport. You may contact our Concierge to assist you with booking transportation. They can be reached by phone at 313.465.1786. A $12.00 daily resort fee plus applicable tax (15% for occupancy and sales taxes) is applied to each hotel reservation and will include amenities that are sure to enhance your experience at MGM Grand Detroit. The resort fee includes: In-room high speed internet & Wi-Fi, In-room Keurig® Coffee maker, bottled water, unlimited local/toll free calls, access to adult-only fitness room and pool in IMMERSE spa, boarding pass printing and select business center services. What security deposit is required? A security deposit of $100 per stay will be required upon check in. Pre-paid cards are not accepted for room and tax or deposits. Does MGM Grand Detroit Hotel allow pets? Unfortunately pets are not allowed on property, with the exception of assistance animals. Proper documentation may be requested. All of our guest rooms and floors are non-smoking. In the event that smoking occurs in your room, a deep cleaning fee of $250 will be charged to your account upon check out. Please note that e-cigs, vapors, hookahs, etc. fall under our non-smoking policy. We do have designated smoking areas throughout our casino. What types of amenities are included in your rooms? All of our rooms include the following amenities: Hair dryer, iron and ironing board. Coffee makers are not supplied in the room, however complimentary coffee is available in the Hotel Living Room 24-hours a day. Hotel guests will enjoy complimentary access to the Fitness Center & Pool. Access to the spa, pool and fitness center is exclusively for guests age 18 or older. Whatever you desire, the Concierge at MGM Grand Detroit is here to assist.